Earwigs can be pesky visitors to your home on Cape Cod. These tiny insects love water, and although they’re harmless, they’re not exactly welcome. When you need earwig control in Chatham, MA as well as communities across Cape Cod, call on the professionals you’ll find at Pest Pros. Since 1999, we’ve been your locally owned and operated source for earwig control and prevention throughout the area. We are your fast, dependable and environmentally friendly source for a range of pest control services in towns throughout Cape Cod. You can count on us anytime, every time. We understand that unwanted insects and rodents at your Cape Cod home or business represent an urgent problem that requires an urgent solution. We deliver that solution quickly and effectively. Make sure you’re getting the best of the best when you choose Pest Pros for earwig control in Sandwich, MA as well as other towns on Cape Cod. Earwigs are harmless to humans. However, their frightening appearance makes them threatening to a lot of home and business owners. They also produce a foul-smelling yellow liquid from their scent glands that is very unpleasant. While they are mostly harmless to humans, if they are handled improperly they can pinch. 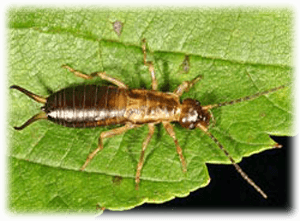 We recommend contacting us to remove earwigs from your home or business. Where do we do our work? Pest Pros serves home and business owners in communities throughout Cape Cod, including Plymouth, Falmouth, Yarmouth, Hyannis, Marshfield, Chatham, Barnstable, Wareham, Dennis, Orleans, Duxbury, Scituate, Kingston, and Sandwich. We make getting earwig control in Barnstable, MA and other Cape Cod communities simple. Call on us for free inspections and estimates and enjoy affordable rates and green solutions should you choose to move forward with service.